You want it all? You got it! The ultimate multi-tasker, Pro Manicure Give Me All! 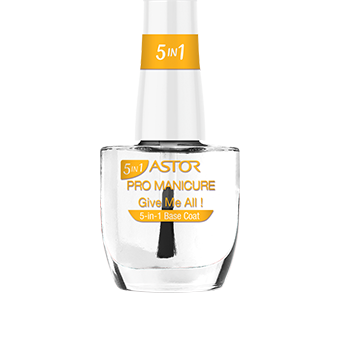 is a 5-in-1 base coat that delivers nail care in one stroke. Paint it on for nails that feel smoother, stronger and shinier. What more could you want? BUTYL ACETATE, ETHYL ACETATE, NITROCELLULOSE, TRIMETHYL PENTANYL DIISOBUTYRATE, ALCOHOL DENAT., PHTHALIC ANHYDRIDE/ TRIMELLITIC ANHYDRIDE/GLYCOLS COPOLYMER, ISOPROPYL ALCOHOL, TRIPHENYL PHOSPHATE, CAMPHOR, AQUA/WATER/EAU, DIISOBUTYL ADIPATE, ACRYLATES COPOLYMER, ETOCRYLENE, ALUMINA, ASCORBIC ACID, CALCIUM PANTOTHENATE, HYDROLYZED SOY PROTEIN, HYDROLYZED ULVA LACTUCA EXTRACT, HYDROLYZED WHEAT PROTEIN, MARIS SAL/SEA SALT/SEL MARIN, NYLON-12, OLEA EUROPAEA (OLIVE) FRUIT OIL, PANTHENOL, PERSEA GRATISSIMA (AVOCADO) OIL, RETINYL PALMITATE, SILK AMINO ACIDS, TOCOPHERYL ACETATE, CARTHAMUS TINCTORIUS (SAFFLOWER) SEED OIL, BAMBUSA VULGARIS EXTRACT, AUCOUMEA KLAINEANA RESIN EXTRACT, D&C VIOLET NO. 2 (CI 60725). 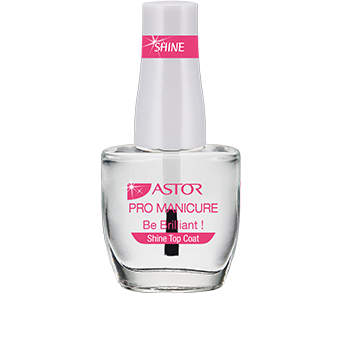 When you want to dazzle like Heidi Klum on the red carpet, give your nails a sensational high-shine finish with Pro Manicure Be Brilliant!. 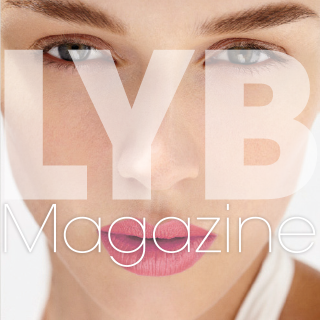 This gloss-giving top coat delivers incredible, long-lasting shine and lustre - so brilliant you’ll need to wear shades! Pro Manicure Give Me Clean! Beautiful nails look wonderfully white – and never yellow. 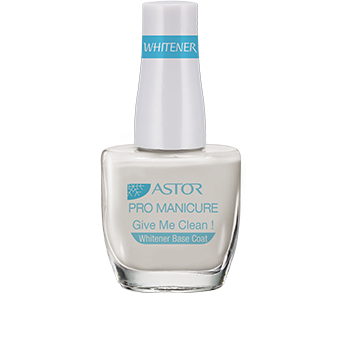 Brighten up tainted talons with Pro Manicure Give Me Clean!, a whitener base coat with immediate results. Pro Manicure Make Me Strong! It’s time to toughen up. Pro Manicure Make Me Strong! is a strengthening base coat that delivers a hard, shiny layer of protection. It’s like a weights work-out for your weak, soft nails.